Possibly Yim Ho is commenting on different social status in broad slapstick form but the film clearly isn't a bellyful of laughs despite. Featuring the Star Wars theme but whistled instead, loud banter, people falling over, in water, Tai Shui being pushed into the entertainment industry (she even takes a slimming pill making her violently allergic to eating) and all culminating in a deserted island scenario that tries desperately to be over the top crazy. Tries. Fails. A sleeping pill. Even locally. As with his Errant Love, Lau Lap-Lap doesn't set out to amp filmmaking techniques and style of Taiwan romance cinema. Some shots with gelled up lenses, bliss- and ache-montages set to moody soundtracks, it's all here and Wells Up In My Heart is truly a cinema soap of its time. What it does offer up that rises it ever so slightly above others is an continuing back and forth for the characters that seems to be heading towards a fate of not knowing what to or how to love anymore, with so much conflicting truths around them. This complexity probably deserves better filmmaking skills but the movie stands out when placed in correct context. Leads Shirley Lui and Liu Wen-Zhen also display good chemistry. Co-starring Nancy Lau. Behind its goofy title actually does lies a goofy, gory Tsui Hark movie, his 2nd. One that combines imagery and elements from The Texas Chainsaw Massacre, 2000 Maniacs and cannibal movies in general, that were hot at the time. The end result is plagued with more broad Hong Kong comedy than I can take but admittedly, Tsui churns out some funny gags from time to time, both when it comes to the low-budget gore and visually. The finale takes on a wild aura as it's just very active and Tsui manages to find entertaining ways to introduce roller-skates into it. Norman Chu's Agent 999 character, just like the world's best known secret agent known by another number, has an amusing running gag that he manages to get out of the most hairy situations when dealing with them cannibals. You also get what could surely be the inspiration for the nose-picking transvestite in several Stephen Chow movies and a fun, if not overly clever, Wong Fei Hung reference towards the end (involving one of the reoccurring actors in the old Wong Fei Hung films starring Kwan Tak Hing). Corey Yuen's martial arts choreography also adds a little fun to the mix. There's enough here to like for Tsui Hark followers but We're Going To Eat You is more of a precursor of greatness to come, which obviously makes it essential viewing if you're studying the development of one of Hong Kong cinema's main trendsetters of the 80s and 90s. The cinematography for instance is a combination of well accomplished and typical Tsui Hark nuttiness, something I've always been fond of. And it has to be said, how uneducated it may come off as, the concepts for this and Tsui's debut The Butterfly Murders are cool. 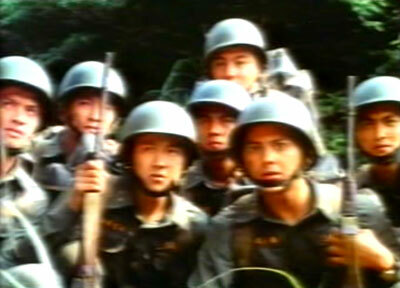 Co-starring Eddy Ko, Melvin Wong and Margaret Lee. We've seen this one before, when it was both called Top Gun, Proud And Confident and to a much lesser extent No, Sir. Therefore Blacky Ko has not so much made a movie but extracted a template and dressed the human pieces of it with different faces. On the army training grounds in Taiwan there are therefore comrade, performance rivalry, strict training in order to bond and improve these soldiers as well as emotional twists where sickness may turn proceedings on its head. Plus you have the romance subplot straight out of Top Gun re-molded a bit and put into this movie but never followed through on so it's safe to say director Ko merely needed some filler. A variation on Europe's "The Final Countdown" is heard before the boys enter their examination mission but then real life circumstances turn into a real, albeit small war. Who saw that one coming? A lot of us and aside from an assured act from Miu Kiu-Wai as the typical drill sergeant with a heart, none of the performers such as Max Mok, Wilson Lam or Kenny Ho inhabit anything else but a shell that holds zero character. Compared to dreck like No, Sir however, Blacky Ko knows how to spice up the training sequences more and some of the more epic shots register favourably. At times a little cheesy and uneven pace-wise, Samson Chiu's What A Wonderful World is still a worthwhile study of sensationalistic journalism and newly found humanity in the face of terminal disease (a plot device that's been used fairly frequently by Hong Kong filmmakers). Some of the characters, especially the reporters and the police are a fair bit overblown and stereotypical but the performances by Andy Lau, Kenny Bee and Teresa Lee carry the film well enough to not let those things bother in the long run. Jacky Tang's beautiful scenic photography greatly enhances as well. Paul Fonoroff and Kent Cheng logs cameos. Wong Jing in good form mixing the manic and movie parodies, Anita Yuen's Ko Siao-Ping picks up pearls for a commercial shoot heading by her half sister (Christy Chung who doesn't remember her) but they contain the genie Bolobolo (Michael Wong) who grants her three wishes. Starting out by making a dig at his own work, Wong Jing then proceeds to put Law Kar-Ying in a number of parodies ranging from Chungking Express (Wong Kar-Wai gets ridiculed plenty of times throughout the movie), A Chinese Torture Chamber Story to US action hit Speed. 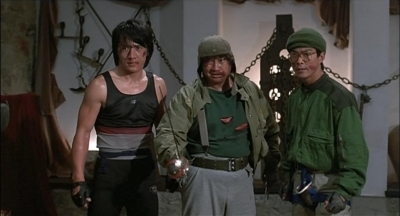 Focusing on the oddity of Michael Wong as a bit of crap genie, the key to success here is energy and game performers who at one point in the movie can act in any way and within the aura of the film it tickles you easily. Jordan Chan in particular in an energizer bunny in this one, going from horny office worker to being transformed into the most kind man ever by the genie. Something that has its drawbacks. Amazingly Yuen's period tale of police corruption manages to come out on top despite being anything but subtle. Newly examined constables (Jason Pai, Sun Chien and Danny Lee) soon find out the entire force is corrupted and that they're expected to fall in line with established system of bribery and corruption. When they don't and instead try and uphold the law alone... let's just say that there will be blood. Yuen is continually spelling out the movie in dialogue, its darkness, the frustration main characters feel and how eeeeeeevil everybody else is. Yet, there IS an intelligence and darkness on display here. Strands about going with the flow and not resisting, for safety and comfort, despite knowing it's morally wrong becomes mental talking points for the movie and. Adding onto this a furious pace and intense violence, What Price Honesty makes so much noise that it seems desperate to be heard. But Patrick Yuen avoids that pitfall and his hard push into pitch black territory is deserved and warranted. Action-choreography serves the thriller-narrative, with a couple of weapons-fights involving an animalistic Lo Lieh ranking as highlights. Also known as The New One-Armed Swordsman '94, just like Tsui Hark's The Blade the following year, there's only minor traces of the Chang Cheh movie (whether it's One-Armed Swordsman or the third entry The New One-Armed Swordsman) in this new version and vision so the more you watch BOTH said 90s movies the more preposterous the idea of claiming remake-status becomes. Which is a good thing and Daniel Lee's (Till Death Do Us Part, Black Mask, 14 Blades) changes setting dramatically to a Wuxia pian in the 1920s while still maintaining this world is populated by swords. A distinctive, cool choice and What Price Survival is often a hypnotic, gorgeously designed film with poetic imagery that lingers. 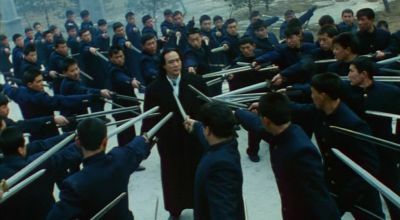 With a simple story arc of Wu Hsing-Guo's (Temptation Of A Monk) Wang Ning being tricked into a duel to the death with his father (David Chiang) in order for rival Wang Ching Kuo (Norman Tsui) to take over, be number one etc, Daniel Lee crafts a film that for a fair amount of its time shoves down the importance, depth and poetry into our throats. It IS a cool setting and take on the genre but the emotional beats are very empty and the product becomes a hybrid of pure talent on display and pure empty talent on display. The veterans shine however in all their iconic glory and Jackson Ng's quick-cut action often captured with a handheld camera does play into the unusual and cool vision of Daniel Lee's here. At other times it is also difficult to follow this stance on action and it wouldn't be the first or last time Lee has shown affection for an over-active camera. For better or worse. Also with Charlie Yeung and Jack Kao. Shot on location in Barcelona, Jackie Chan, Sammo Hung and Yuen Biao team up in big fashion again after 1983's Project A. Although scaled down in comparison, the setting and that choice is refreshing. As is Sammo handling matters and infusing the action with a lot of hard hitting power. But what isn't clicking is the comedy and the excessive running time chosen to convince us that it is. Pleasant enough at the start with Jackie and Yuen as fast food vendors getting involved in Sylvia's (Lola Forner) life but she carries with her an aura of trouble. Being sought after by both a private detective (Hung) and villains, Hung stages more mild comedy involving the initial three. Part pleasant, sometimes even funny and visually clever, whatever momentum there was seriously peters out eventually and we sit waiting for any sign of stunt- and fight-oriented action. Thankfully every emergence of it thrills, with Sammo showcasing again why his powerful stance on action is so compelling. A single punch can excite and he does so tenfold when introducing Benny Urquidez and Keith Vitali as Western fighting foes. Both of them keep up extremely well with action-beats, dishing out and taking punches along the way. Culminating in a long and varied castle-finale that doesn't redeem any shortcomings but certainly makes it a recommendation. Even if the milder one involving the trio at hand. It's a fairly professional looking but sedated atmosphere provided by otherwise solid director David Chiang. No doubt, Bill Tung is much of the time spot on in playing the driven but not harsh Uncle Lam and his banter with Wong Wan-Si is often times enjoyable. So is the sweet youth romance hopefully happening between Michael and Wong Yim-Chao but the overall flame in the movie can barely be seen or felt before the final 10 minutes where finally a sweet, basic aura is achieved. Lawrence Ng and Paul Chun also appear.